This is the TOTO Pressure Balance Valve, which is perfect for your plumbing needs because it includes everything you need in a valve, including anti-scald capability, diverter, pressure balance, and shut-off functionalities. 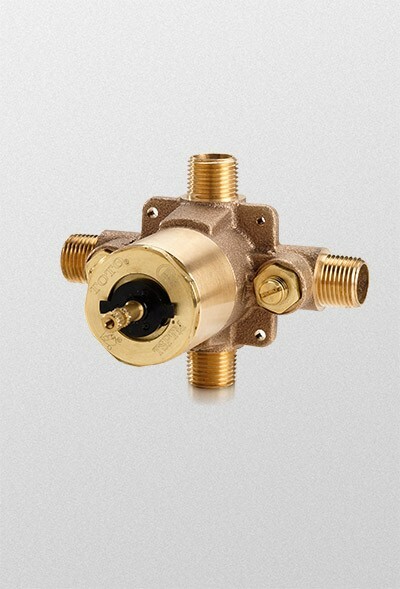 Designed to work without crossover piping, this valve requires 1/2 NPT connections and is constructed of durable, corrosion-resistant brass. Customers appreciate its smooth operation as well as its simple installation. Its anti-scald capability is based on its temperature limit stop, which you can adjust to meet your needs. Includes bathtub port and check valves. As always, you can be sure you're getting the top name in quality and dependability when you purchase a TOTO bathroom product. WARNING: This product can expose you to chemicals including, lead which is known to the state of California to cause cancer and birth defects, or other reproductive harm. For more information go to www.P65Warnings.ca.gov.